At Everest reupholstery of furniture is a busy part of work we offer for our customers. 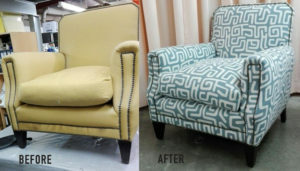 It is often amazing to look at the difference between when the furniture arrived and the new reupholstered finished item. We are sometimes amazed at how a tired old sofa can end up looking so fresh and good as new. One of the challenges in reupholstery is fixing an already poorly constructed sofa or chair. With upholstered furniture, it is hard to tell how the piece is constructed until you remove the fabric and discover what lies beneath. We have often had to undertake remedial frame work in order to get the piece back in working order. That is where having a furniture joinery often comes in useful. 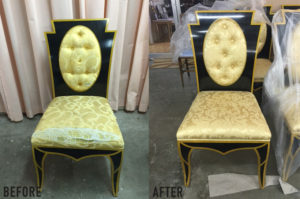 We can often make adjustments to the frame of a sofa or chair where a additional curve needs to be created. Changing the feet or adding a special wood colour are all possible. Coupled with the large range of upholstery fabrics that everest has available, means that we can tackle nearly all reupholstery requirements by customers. Fabric prices are one of the larger costs associated with reupholstery. It often depends on how much the customer is willing to spend. Reupholstering a sofa can be anywhere from 2000AED up to over 9000AED. It depends on the fabric you wish to use. The other consideration is the timescales needed. This often depends with how busy the factory is and how many items are needed for reupholstery. Normally reupholstery takes 2-3 weeks. This can depend on whether fabric needs to be ordered from abroad which can add time to the job.